Conservation Crew Member with Tree of Heaven Growth. The Verde River is treasured for its wildlife habitat, water supply, recreational opportunities, and natural beauty. It is one of the most substantial free-flowing rivers in Arizona. 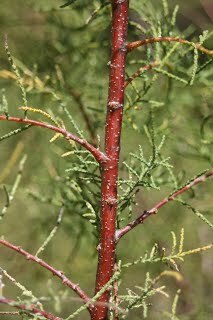 Although the river corridor primarily supports native riparian vegetation, invasive species — particularly saltcedar (Tamarix spp. 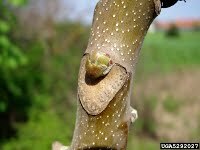 ), Russian olive (Elaeagnus angustifolia), tree of heaven (Ailanthus altissima) and giant reed (Arundo donax) — threaten the health and sustainability of these communities. 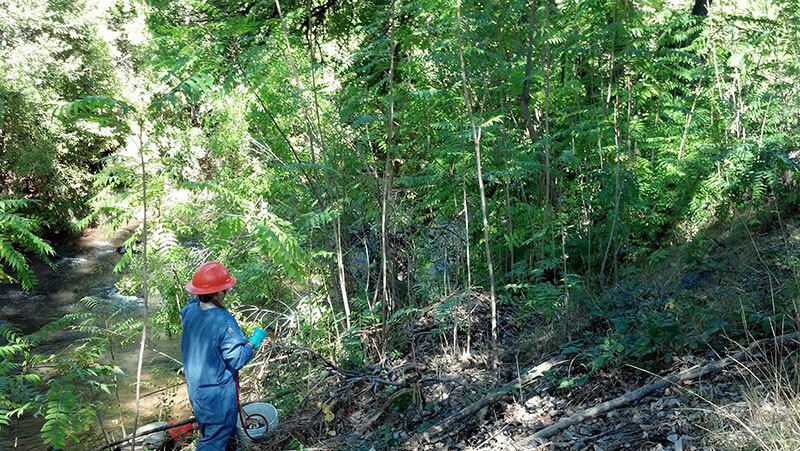 Our Cooperative Invasive Plant Management Plan (CIPMP) was initiated in 2010 to bring together federal and state agencies, private companies, nonprofit managers, and landowners. 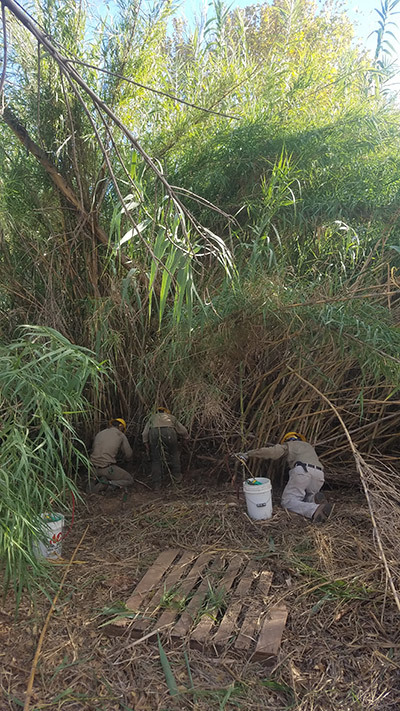 Its purpose is twofold: to develop a strategic approach for controlling invasive plants in the riparian corridors of the Verde River Watershed and to increase the level of collaboration and communication among stakeholders and the local community. Download a PDF of the full Cooperative Invasive Plant Management Plan here. In its new environment, a non-native, invasive plant is free from the other plant is free from the other plants, insects, and pathogens – the natural “checks and balances” – that kept it under control in its native range. Once established, populations of non-native, invasive plants can harm property values, wildlife habitat, water quality, and recreational access. 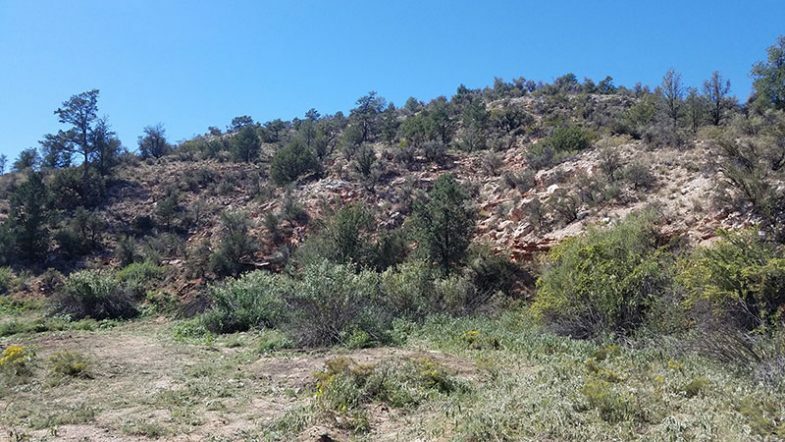 Some non-native invasive plants in the Verde Valley increase the frequency and intensity of wildfire, and others are toxic to livestock. One of our priority invasive plants for control is tamarisk, or saltcedar, which colonizes rivers and streams. Left unchecked, tamarisk can create monocultures – dense stands where nothing but tamarisk grows. 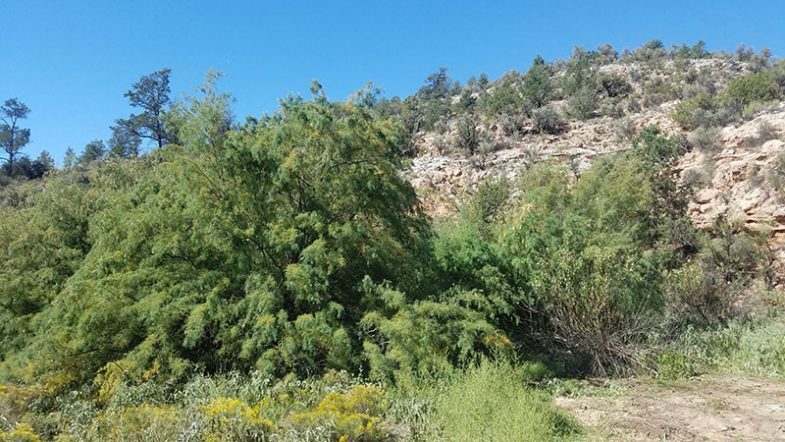 While an individual tamarisk tree does not necessarily use more water, tree-for-tree, than a native cottonwood or sycamore, tamarisk stands are denser, and more trees per acre means more water use. In an arid watershed like the Verde, this can contribute to drying up our surface and groundwater systems. 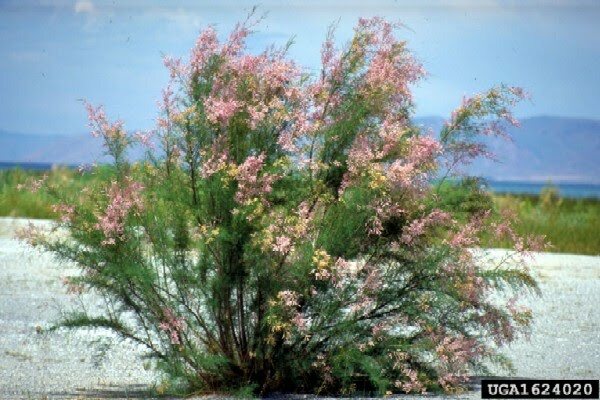 Tamarisk is one of the most widely distributed and troublesome nonnative, invasive plants along water courses in the southwestern United States. This tree was introduced throughout the western United States from Eurasia as an ornamental and for windbreaks. It escaped from cultivation infesting floodplains, riverbanks, ditches, marshes, waste areas and roadsides; including many natural areas and state and national parks and monuments. It forms dense impenetrable thickets that crowd out native plants. It accumulates salt in its tissues, which is later released into the soil, making it unsuitable for many native species. It will colonize along rivers and streams, dropping seed into the water for distribution and further colonization downstream. Mature tamarisks have deep, extensive root system that make physical removal a daunting task. The dense stands that tamarisk forms along with the large quantities of dead branches and leaf litter are caught in tamarisk branches increases the likelihood and impacts of wildfire in areas where it grows unchecked. A tall rhizomatous perennial grass. Introduced from Southeast Asia as an ornamental, it is invasive throughout the warmer freshwaters of the United States from Maryland westward to northern California. Once established, it tends to form large, continuous, clonal root masses, sometimes covering several acres. Giant reed grows very rapidly and can establish quickly from fragmented rhizomes or stem nodes that take root. 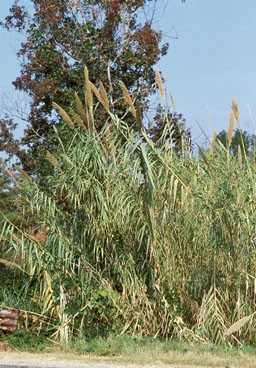 Giant reed provides neither food nor habitat for native species of wildlife as it produces a wide array of chemicals that protect it from most native insects and grazers. 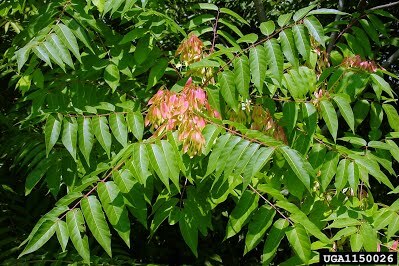 Tree of heaven is a twiggy rapidly growing tree. Originally introduced from Taiwan and central China as an ornamental it was soon abandoned due to its foul smell and suckering. It will sprout aggressively when cut back from an extensive root system. Dense clonal thickets will displace native species, filling large areas quickly. Additionally tree of heaven roots and clonal sprouts will push up through concrete cracks and will damage buildings and water systems. Russian olive is a multi-stemmed deciduous bush or small tree. It was introduced from western/central Asia as a windbreak species and an ornamental. Young branches are silvery and often bearing course thorns. The leaves are generally lanceolate to oblong in shape. They bloom in early summer in small clusters of 1 cm long, highly fragrant flowers with a four-lobed creamy yellow calyx. The silvery brown fruit that result are what give the tree its name despite not being of the olive family. Russian-olive can resemble some willow species with light green foliage, particularly sandbar willow. However, unlike Russian-olive, willows have inconspicuous flowers on erect stalks and small, wind-dispersed seeds. The seeds of the Russian olive are spread by birds that savor the fruit and some vegetative propagation. 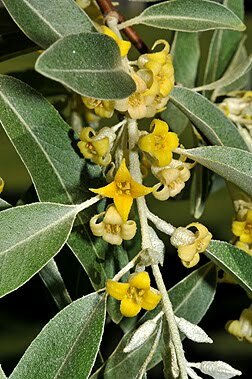 Russian-olive is an invasive species in many places in the United States but is most invasive in riparian areas in the western U.S. Its ability to fix nitrogen that allows it to thrive on poor soil, its low seedling mortality rates, and rapid maturation helps it outcompete native vegetation. Although this species is used by wildlife it is used to a lesser degree than native vegetation. For instance native beaver rarely harvest Russian-olive trees. Additionally, some authors have suggested that Russian-olive may alter stream hydrology and nutrient cycling.